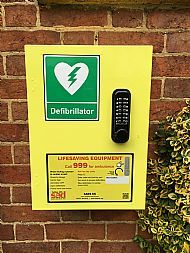 We are very pleased to inform you that Creaton now has a defibrillator in the village. It is located in a yellow cabinet underneath Poppy's Coffee Shop Window at the United Reformed Church, High Street by kind permission of Creaton United Reformed Church. Always dial 999 first if you find someone in a collapsed and unresponsive state. Then you know help is on its way! If you are within 500m of the defibrillator the East Midlands Ambulance Service (EMAS) control room staff will automatically provide the access details to the caller. If a 999 caller is outside of the 500m area then it will not appear on their system, however, if the caller is aware that there is one in the vicinity, then EMAS control room can provide the access code. This is why it is so important to make yourselves aware of where it is. Why not take a look when you are next in the High Street.